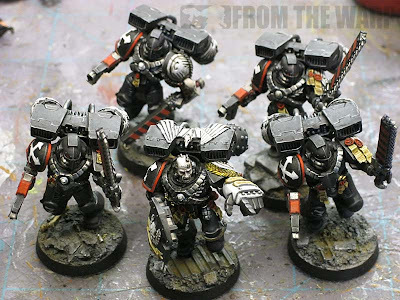 Let me start with saying, I did not paint this squad. Well, not everything on the models. The squad came to me painted, I just had to change some minor things. There was nothing wrong with them when they arrived at my doorstep except for the few things my friend wanted "changed." I swore I'd never do this kind of work again. Not because it's technically tough to do, but because it's so time consuming and you never know what you're getting into. You have no idea what kind of problems you'll run into trying to "fix" something that isn't broken. 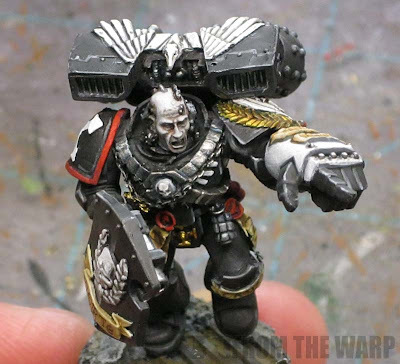 I've done this kind of "restoration" work once before on a Chaos Lord model and said to myself never again. When my friend emailed me and asked if I could take care of this for him, I obviously said no and stood my ground knowing the trouble involved. And the models arrived a few days later. In the end, I didn't do too much to them and my friend loves the way the models look now. That's the most I could hope for. There weren't any real issues when it came to working on these guys either so I lucked out there. Now I swear I'm not doing this kind of work anymore. I'm always a little nervous with this kind of thing as well. It's not just time consuming, but anything you do on top of the original work is permanent and you just have to hope what you do works and is what the other person wanted. Besides, I don't know about you, Ron, but I tend toward projects I am passionate about. Rarely am I excited to do fix-it work and tend to drag my feet on it. They do look fantastic, though. So I guess we can consider this a success ;-) Oh, and your work on that Chaos Lord was great. Good to have a second chance to say so! 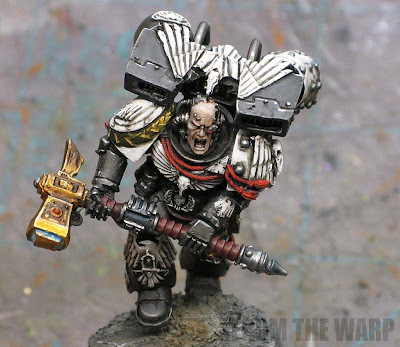 One small question: Does anyone know where that bare head on the model with the power fist is from? Doing touchups is a difficult thing I think, if it isn't your work. (Mostly) Because you have to make whatever changes meld with the rest of the model. It can be very challenging. Glad to hear your friend likes the change! Krisken: I understand completely, there's no investment in the project. And you don't want to mess it up either. KrautScientist: Thanks. Unfortunately I do not know where that head comes from. Fayte: That was the biggest thing... making the adjustments "blend" with the rest of the model so you can't tell the difference. The Sgt head is from Forgeworld Raven Guard upgrade pack. Yes, thanks a lot! I'm always looking for characterful bare heads, so that information really helps. I feel the same way when it comes to adding models to an army I didn't paint originally, and am asked to match not just to the previous paint scheme, but style and quality. Very tedious and time consuming, and you're 100% right in that there is no true investment into the project for me. Either way, you did a fine job, Ron, as I can't really tell where the original paint job starts, and any touch-ups begin. Tim: Thanks. I didn't do much so the blending of the two wasn't too hard this time. 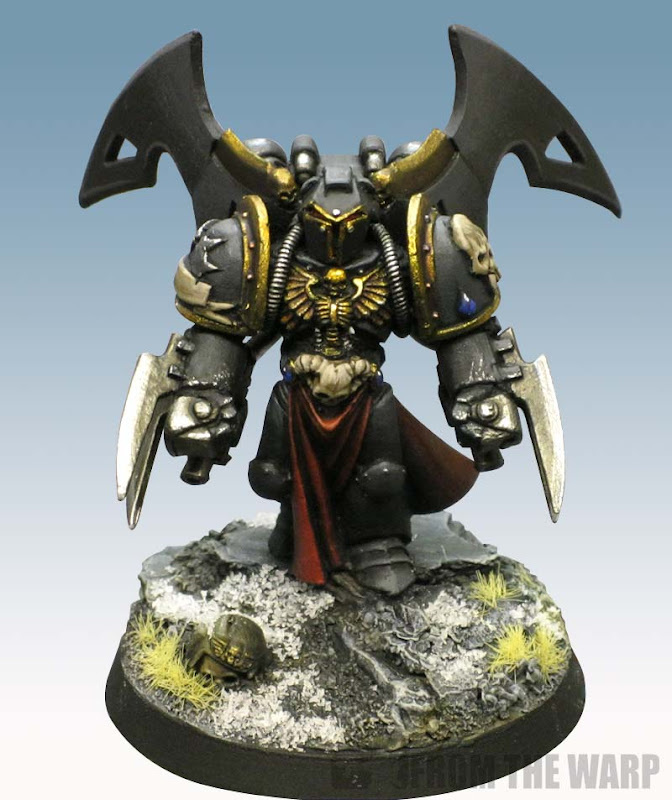 I never thought about adding more models to an army though. I can see how that can be real tough starting from scratch and trying to match an existing color scheme in it's entirety. Muskie: I can't bring myself to touch up old models. If anything I strip them completely and start over. I like to see the old work... unless you're talking about the odd chip here and there due to gaming. Those I'll try and repair. I used to love restoration work when i was younger but now with a family and career and so little time I loathe it. Starting from scratch is so much easier and creative. Anon: Who would have thought starting from scratch would be so much easier in the long run? Great looking stuff as always.